Monahans Sandhills State Park consists of 3,840 acres of sand dunes in Ward and Winkler counties, about a half-hour's drive south­west of Odessa. The park opened in 1957. Ward County owns 300 acres of the park. The state leased the re­main­ing acres (about 3,000 acres from the Sealy-Smith Foundation and about 800 acres from the Williams family of Monahans). Native Americans were present in this area as far back as 12,000 years. Various tribes, most notably Apache and Comanche, used the area for temporary campgrounds and a meeting place. They found game, abun­dant fresh water beneath the sands, and acorns and mesquite beans which they ground into paste with stone tools. 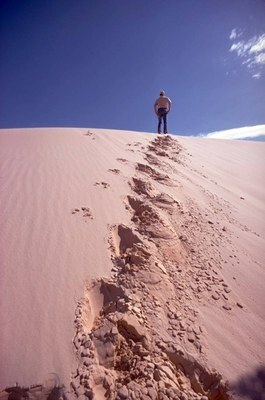 More than 400 years ago, Spanish ex­plorers were the first Europeans to report the vast hills of sand. Native Americans continued to use the area until the 1880s. That’s when the Texas and Pacific Railroad selected Monahans as a water stop between the Pecos River and the town of Big Spring. In the late 1920s, oil production began in what is now known as the Permian Basin. Today, Monahans is a shopping hub for more than 800 square miles of oil and cattle country.